Capsule Summary: Radar types out the 4077th’s weekly activity report and personnel record, which includes a wounded Chinese prisoner, Klinger being examined by a psychiatrist, and Hawkeye falling in love. This is a notable episode for two very different reasons. First, it marked the first guest appearance by the late Allan Arbus as an army psychiatrist, in this episode named Milton Freedman. Starting with his second appearance later in Season Two the character’s first name was changed to Sidney. Arbus would make 12 appearances on M*A*S*H, the last of which was in the series finale. Second, this episode featured one of the darkest moments on M*A*S*H, when Trapper — enraged a the death of his patient — stormed into the wounded prisoner’s tent and stood there ominously until Hawkeye calmed him down. In that moment, Trapper appeared truly conflicted and genuinely a little sinister. One could argue that this was an example of Hawkeye being a bleeding heart. I would suggest it was the an attempt present both sides of an emotionally charged plot. The prisoner wasn’t actually acting maliciously and certainly didn’t actually attack or wound Trapper’s patient or otherwise intentionally harm him. At the same time, Trapper lost a patient due to the prisoner’s actions who otherwise would have lived. I do think the music that began playing when Margaret came in the scrub room to tell Trapper the patient had died was a little much, a little too dramatic. It was actually distracting. 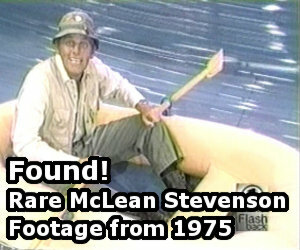 There was more to the episode than Trapper’s storyline. Klinger’s evaluation by Major Freedman was amusing if not unexpected, since actually being found insane would have meant the end of the character. Klinger obviously wasn’t too concerned about the evaluation because he didn’t let it stop him from wearing women’s clothing and bucking for a Section 8. Hawkeye’s storyline was bizarre. He met Lt. Johnson for the first time during surgery and hours later decided he wanted to marry her? The point, of course, was to switch things up and have Hawkeye on the receiving end of someone who doesn’t want a serious relationship. The story line works but I still think it is odd. The central conceit of the episode, that Radar is writing a weekly report and including various events that happened at the 4077th during a single week, falls apart when you stop to consider that he wasn’t present for a lot of what happened. The P.A. announcement about the generator heard when Hawkeye and Erika are in her tent wasn’t part of the script. According to Larry Gelbart in a May 1999 post to the alt.tv.mash Newsgroup, it had to be added during post-production because there was a problem processing the film for that scene. The Klinger plotline is funny, and anytime Sidney (well, Milton, for now) shows up is welcome, but Trapper’s anger over the loss of his patient is the definite highpoint of the episode. A very powerful, dramatic moment, one that kind of points to later seasons of the show. Nice to have a scene with Trapper outside of the usual clowning role. And I love Hawkeye’s “That’s not what we’re about” line that snaps Trapper out of it. However, Hawkeye wanting to marry Lt. Johnson so soon after meeting her is ridiculous. I showed this episode to my brother once, and his reaction was “Where did THAT come from? !” It’s actually not a bad idea, and if it had been established that they had been seeing each other for some amount of time prior to this episode, it might’ve worked better. But, as it stands, it’s just too random, and frankly, too out of character for the Hawkeye of the earlier seasons. That “huh?” moment aside, I really do enjoy this episode. I had a different take on the Lt. Erika Johnson part – it never occurred to me that Hawkeye really wanted to marry her – it was just him wanting to “lock her up” for the duration of the war, or the time she was there – much in the same way he wanted to with Maggie Cutler, and with Aggie O’Shea – because you see that he isn’t so much devastated by Johnson’s not wanting to get married, once she agrees to a “honeymoon” anyway. He also was kind of rebounding with glee because he had held himself at bay when he thought she was married. Sidney (or Milton) was portrayed very differently in this episode. He is much more snarky here and seems very cynical. I find it hard to believe that he would be invited to part take in a poker game after the way he speaks to both Henry and Klinger. Glad they took his character in a different way for the later episodes. This episode also showcased Trapper’s frustration at his situation in the war. The scene in the POW tent perfectly demonstrated how his character could have changed due to the war. Had Wayne stayed on, I’m sure they would have explored this more. Great episode. Love Klinger’s dresses and above all, welcome to the insane asylum, Dr. Freedman. Seeing this episode, I found parts to be a little too preachy especially when Hawkeye tried to talk Trapper out of harming the Korean who sabotaged Trapper’s patient. I agree with Seoul City Sue that Dr. Freedman was a little snarky but in time, he mellowed. The scene when Frank bit Klinger’s neck thinking it was Margaret was bizarre. Frank: You get out of here, you pervert! Klinger: Pervert? Who bit who, Major? Anyone have an idea why Hawkeye salutes Frank in this episode? Was he just in a good mood, or was he not really paying attention while walking and thinking of other stuff, and did it as a reflex (which would be out of character for him)….or was it a joke in some way that I don’t get? I like Henry’s reaction after Klinger says he doesn’t normally wear floor length at that time of day.